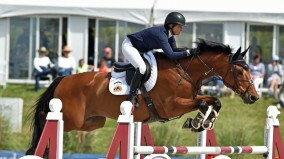 Beezie Madden will represent the United States at the Nations Cup in Rome. Photo by Kimberly Loushin. USEF named the following athletes to the NetJets U.S. Show Jumping Team for the FEI Jumping Nations Cup CSIO***** Rome, Italy from May 23-27. The team will compete under the direction of the U.S. Show Jumping Chef d’Equipe/Technical Advisor Robert Ridland. Updated May 24: U.S. Show Jumping Chef d’Equipe/Technical Advisor Robert Ridland will lead the team of Laura Kraut and Confu, Beezie Madden and Coach, Spencer Smith and Theodore Manciais, and McLain Ward and HH Azur as they vie for a strong finish in the famous Piazza di Siena. The U.S. team will compete fourth in the order. Kent Farrington and Lauren Hough, originally announced as members of this team on May 17, have both been withdrawn from the CSIO***** Rome. The Ohlala Group’s Ohlala has suffered an injury, and after being evaluated by the veterinarians, it was decided that competing in Rome would not be in the best interest of the horse. Farrington, after two very successful outings at the Royal Windsor Horse Show (England) and the Jumping International La Baule (France), has reevaluated his and his horses’ “return to play” program and after discussions with the Ridland and looking at the long-term goals, Farrington has decided not to compete in Rome. The Royal Windsor Horse Show was Farrington’s first competition back after suffering a broken leg.